Graduates get in the spirit at the morning session Friday. The 3,375 online students getting diplomas from Grand Canyon University during ceremonies this weekend are bringing more than their gowns and mortarboards. They’re also bringing their hopes for the future. An African immigrant plans to use his diploma to help his native Liberia mend from years of war and corruption. A Navy recruiter hopes to create a nonprofit to lift disadvantaged children from poverty. A former IBM manager is committed to helping others find their workplace passion. 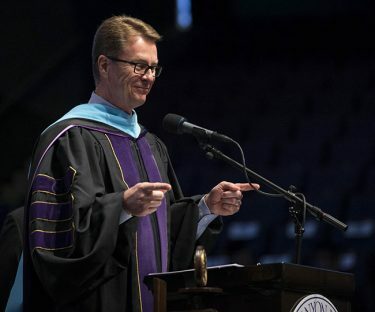 Dr. Tim Griffin, GCU’s pastor and dean of students, speaks to the crowd at commencement. While their GCU degrees, experiences and post-graduation plans differ, the 2016 online graduates share a singular trait – gratitude. 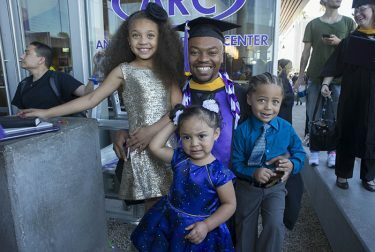 These nontraditional students who juggled full-time jobs, families, and homework credit the flexibility of GCU’s online program and supportive teaching staff for their degrees. Dr. Tim Griffin, GCU’s pastor and dean of students, understands first-hand the importance of support. He’s receiving a Doctor of Education in Organizational Leadership and gives much of the credit to his doctoral chair — Dr. June Maul, who retired recently. “I was lucky to have a rock-solid chair,” Griffin said. Dr. Hank Radda, GCU’s provost, said supporting online students is a top priority. “GCU is dedicated to rigorous programming delivered through an online classroom that is faculty led, highly interactive small group discussion based and writing intensive,” he said. Graduates say having the support their family is critical. Graduates also share an appreciation of the unwavering backing of family and friends. As proof, nearly 17,679 guests were expected to attend the four ceremonies Friday and Saturday at GCU Arena. 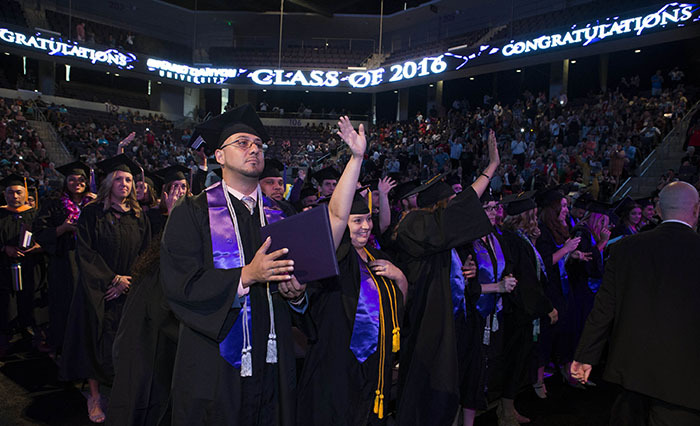 Nearly 550 GCU staffers serving as volunteers will join them in applauding the graduates. Harry Ar-toe Gkornean grew up with unrelenting violence, political turmoil and civil war in Liberia. When he was 10, his father was killed, slamming his family into grief and poverty. By the time he entered the University of Liberia, he’d decided his life’s mission was to help Liberia recover from its traumatic history. 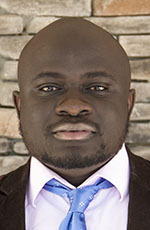 After graduation, he emigrated from Africa to the U.S. to further his goal. “The destruction of my home country was a result of lack of leadership,” said the 31-year-old Minnesota banker, who was drawn to GCU for its Christian foundation. His GCU Masters of Science in Leadership brings him one step closer. His advice to online students: Time management is critical. The lack of it increases your chance of failing. On the flip side, efficient time management makes it easier to participate in discussions and meet deadlines, and it reduces stress. Ten years after graduating from high school, Marlene Armijo made the decision to enroll in GCU. She made the 2012 decision for herself and her two children. 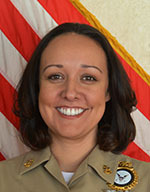 “I wanted to set the example for my children by going to college, showing them the importance of education,” said Armijo, a Chief Petty Officer for the U.S. Navy’s Denver Recruiting District. On Friday, after nearly five years as a GCU online student, Armijo will receive her Masters of Business Administration. Along with building a bond with her school-age children, GCU strengthened her faith. Advice: Embrace online learning. Before enrolling, Armijo considered herself a classroom learner and worried about her ability to learn via the computer. The help from GCU teaching staff and camaraderie from fellow students proved her fears wrong. When Tony Reed graduated in 1982 from Morris Brown College in Atlanta with a degree in psychology, he planned to soon earn a master’s degree in clinical psychology. A 30-year career with IBM Corp. got in the way. At 54, the North Carolina resident finally took action on his youthful goal. He enrolled in GCU and is graduating with a Master of Science in Industrial Organizational Psychology. “During the early years in the ’80s, there were no online graduate programs for psychology. I just couldn’t quit my job to go to school full-time,” he explained. After researching different online programs, Reed selected GCU for its academics and flexibility. That was two years ago, and Reed now plans to combine his career experience and graduate degree to mentor others. “I would like to help young people become more of who they are or can become, helping them accomplish amazing things without fear or procrastination,” he said. Advice: Be honest about your commitment. Do you have the time and the discipline for reading, studying and taking tests? If so, schedule classwork like you would book a doctor’s appointment. And don’t cancel. The challenges Kimberly Allen faced as a GCU online student paled in comparison to her personal life. While in college, both her parents became ill and died. Her husband, a former minister turned speaker, traveled frequently, leaving the Wisconsin piano teacher in charge of their three children. “I faced crazy life struggles, but I am stubborn. I wasn’t going to quit,” Allen said. She worked hard to overcome anxiety over technology. Nap time was study time. Her goal was to graduate with an education degree and teach in a nearby school. Advice: Avoid the naysayers. Well-meaning friends often told Allen to wait until her children were older and her husband traveled less. “I just didn’t listen, and neither should you,” Allen said.